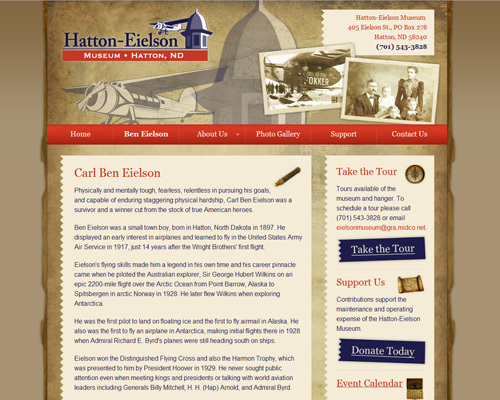 If you’d like more information on the Hatton-Eielson Museum and the Eielson Hanger, contact us via the contact form or information below. Tours available of the museum and hangar. Open every Sunday from 1:00 PM to 4:00 PM from Memorial Day to Labor Day. To schedule a week day tour please call (701) 543-4097, 543-3725, or email joyiv@midco.net. Contributions support the maintenance and operating expense of the Hatton-Eielson Museum. There are no events. Please check back. Copyright © 2016 Hatton-Eielson Museum. All rights reserved.